If you gave up chocolate, caffeine, alcohol, most fruit and veg, wheat and dairy, wouldn’t you expect to hanker after sourdough toast with lashings of butter, or a cup of real coffee? To dream of rich chocolate brownies or carrot cake with cream cheese frosting? Instead, I have found myself wistfully wishing for tea. Of all the things on the banned list during my months of dietary-detective discipline, the thing I have missed most is a simple cup of tea. This week, finally, I am in tea heaven. Not only am I allowed tea, but encouraged to indulge in a cuppa. Likewise a selection from a list including strawberries, asparagus, capsicum, carrots, sweet potato, pumpkin and honey, among others. All of these are high in salicylates, a naturally occurring component of many foods. Just as some people are dairy or gluten intolerant, some folks have a problem with salicylates. In my attempt to figure out what pesky food stuff doesn’t agree with me, I’ve reached the challenge stage and this week I am challenging my system with food high in salicylates, to see what reaction they cause. After months of choko, cabbage, potato, rice and other bland white food, I am ridiculously excited to cook with a range of colorful, healthy, tasty fruit and veg. 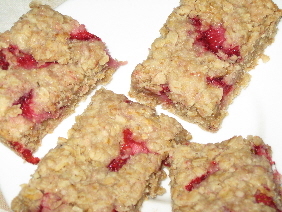 Last night, taken by the urge to make some muesli bars, I threw caution to the winds, embraced the giddy freedom of all this fruit and veg and PUT STRAWBERRIES IN MY OAT BARS. Oh how adventurous am I! 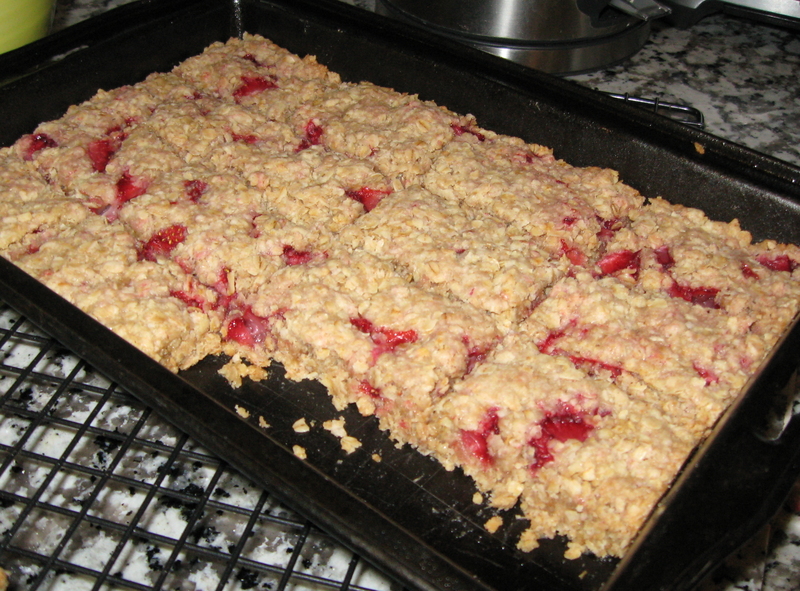 The recipe came from The Failsafe Cookbook; I used gluten free flours and threw in 4 large strawberries, chopped into small pieces. Oh Yum, must be so good to have those foods for a change. The slice looks yummy too – what good timing, strawberries being fairly cheap at the moment.